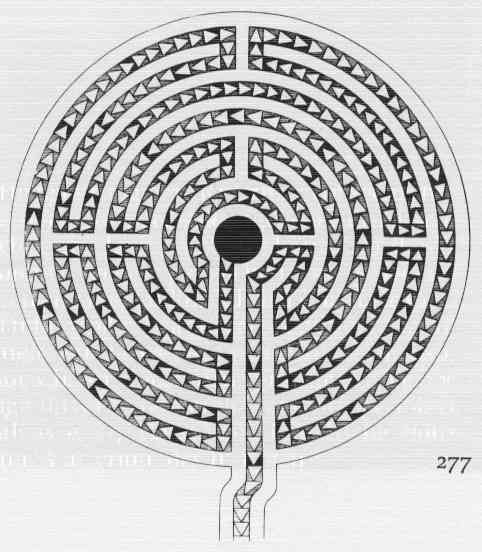 Just like the labyrinth from Ravenna, the Wayland’s House labyrinth is also a historical type of labyrinth with 4 arms and 7 circuits. 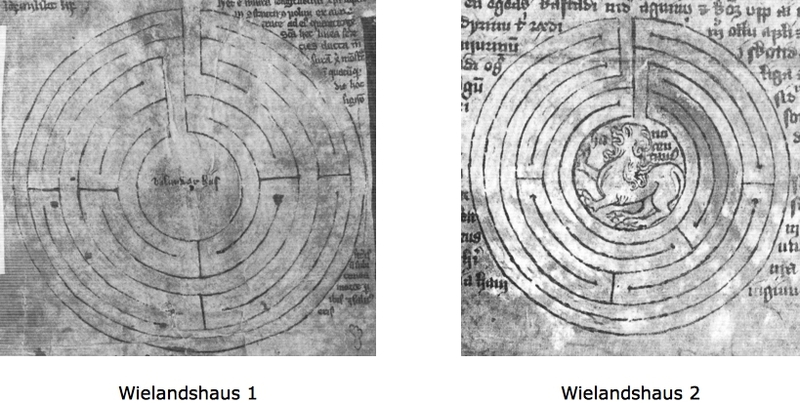 There exist even two different Wayland’s House labyrinths (figure 1). I have named them as Wayland’s House 1 and Wayland’s House 2. Wayland’s House 1 first appeared in a manuscript of the 14th century, Wayland’s House 2 in a manuscript of the 15th century, both from Iceland. This can be easily looked up in Kern. In the following I refer to Wayland’s House 1. 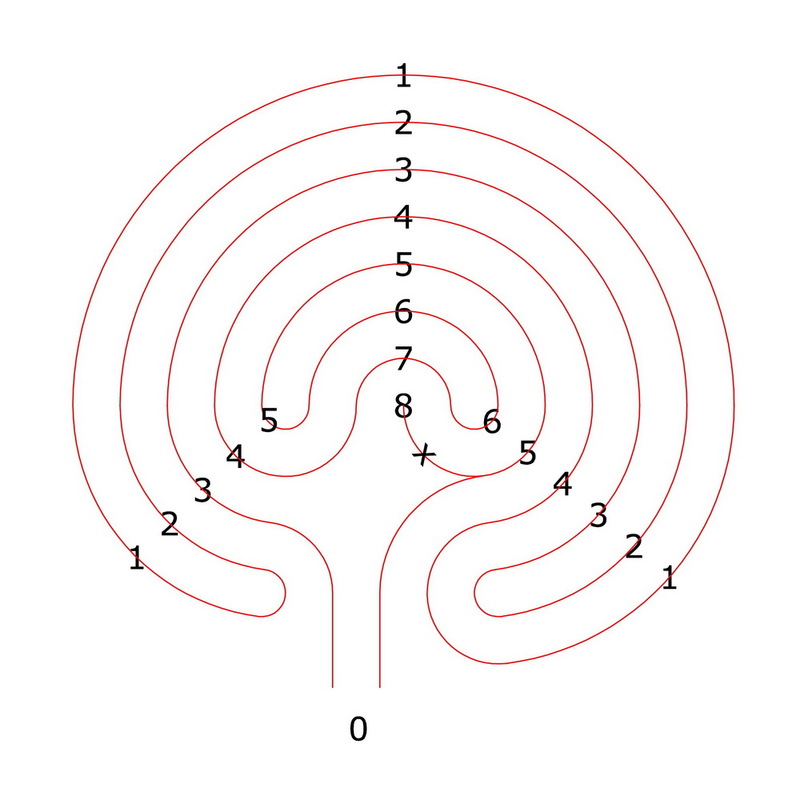 In this type of labyrinth, the pathway does not enter on the first circuit and does not reach the center from the last circuit either. Therefore it is an interesting labyrinth. And also the complementary of it is an interesting labyrinth. This, however, is not the most important reason for why I present this type of labyrinth and its’ relatives here. 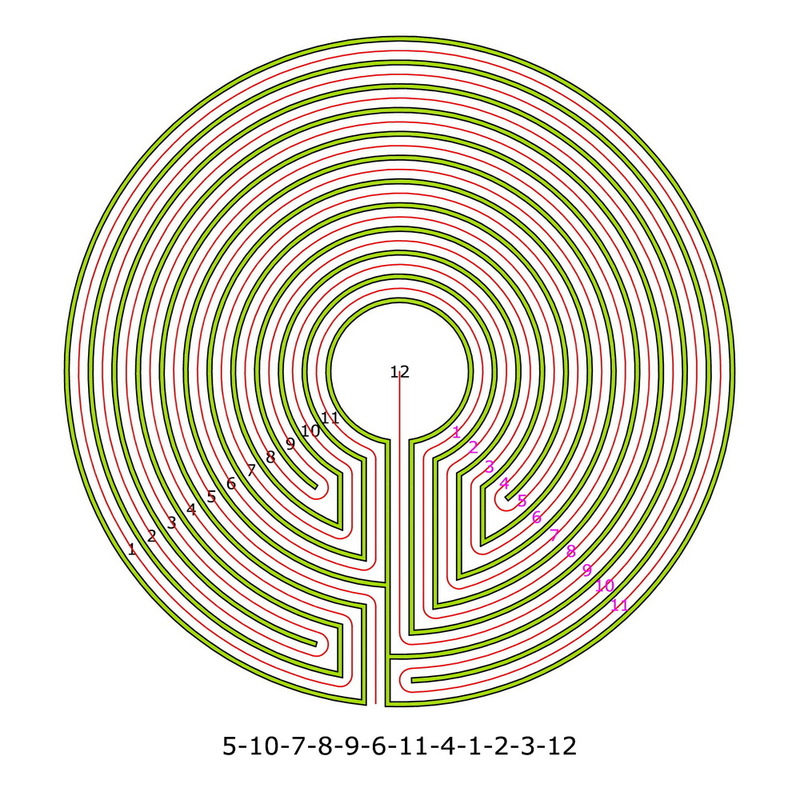 Whereas no existing examples of any relative of the Ravenna labyrinth are known, there exists a contemporary type of labyrinth for each, the dual, complementary and complementary-dual of the Wayland’s House labyrinth. 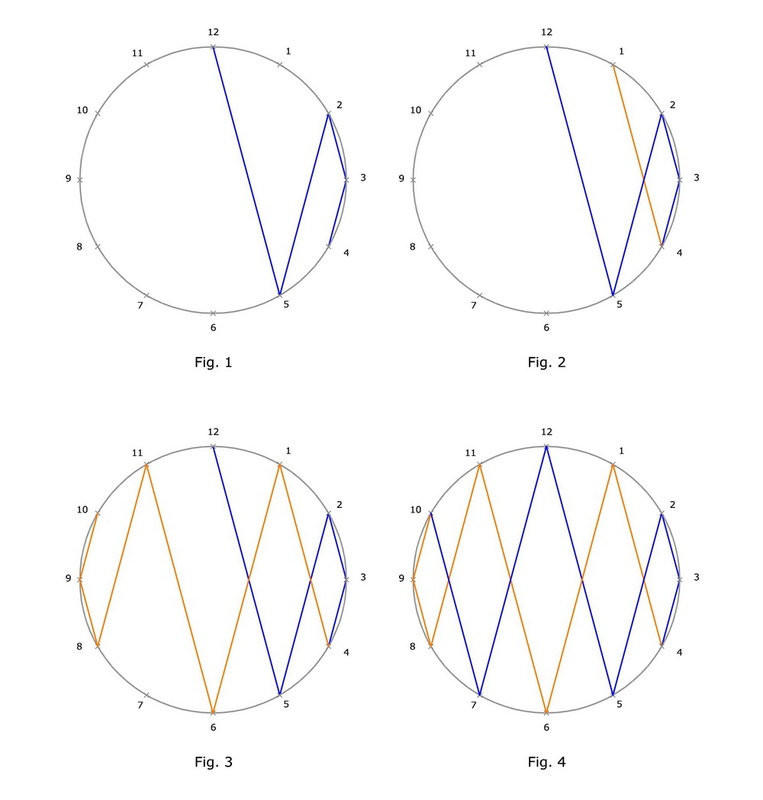 Figure 2 shows the patterns of the original Wayland’s House labyrinth (a), the dual (b), complementary (c) and complementary-dual (d) labyrinths. 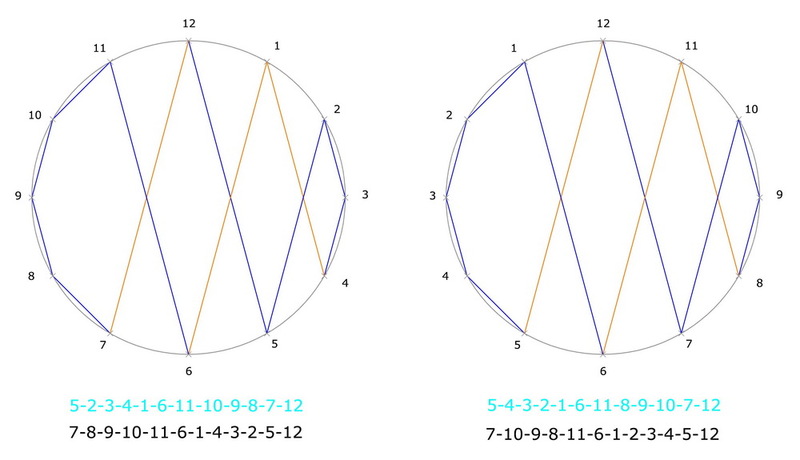 The original (a) and dual (b) both are interesting labyrinths. The complementaries of them, (c) and (d), are likewise interesting labyrinths. 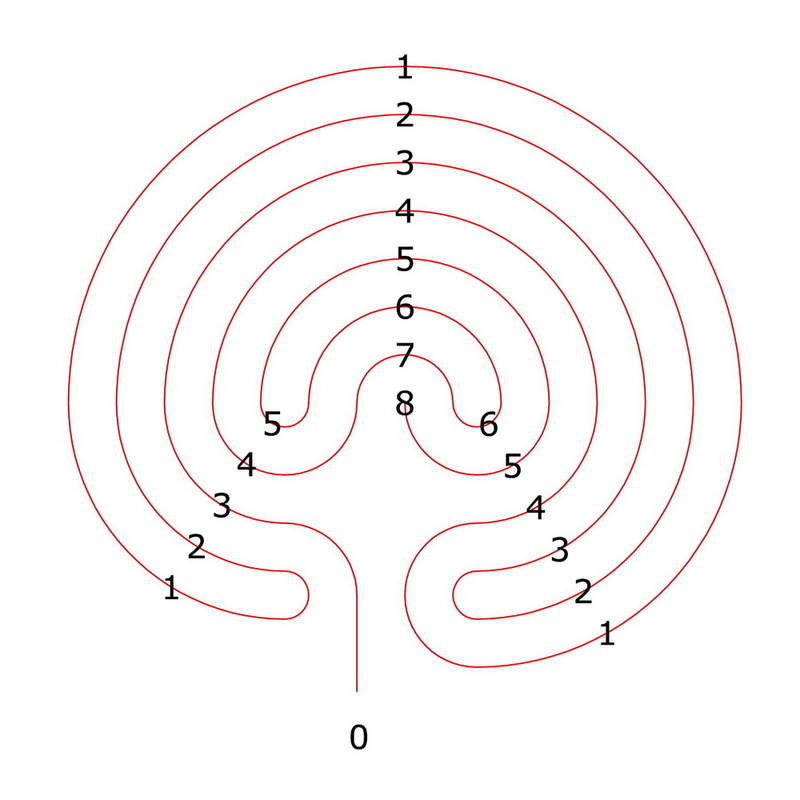 Figure 3 shows the labyrinths corresponding to the patterns in their basic form with the walls delimiting the pathway shown on concentric layout and in clockwise rotation. The relatives of the Wayland’s House type (a) are three of the so-called neo-medieval labyirnth types (there are other neo-medieval types of labyrinths too). 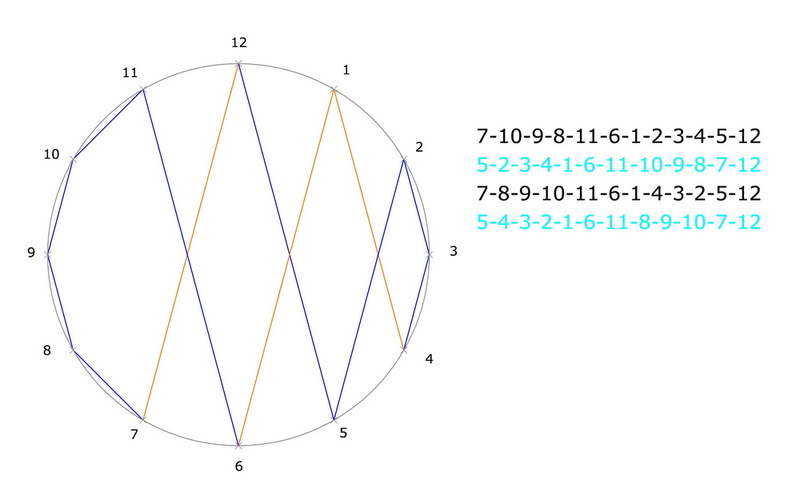 These relatives are: dual (b) = „Petit Chartres“, complementary (c) = „Santa Rosa“, and complementary-dual (d) = „World Peace“ labyrinth. So these contemporary types of labyrinths can be easily generated simply by rotating or mirroring of the pattern of Wayland’s House. This having stated I do not mean to pretend, these types of labyrinths have intentionally or knowingly been derived in such a way from the Wayland’s House type. Rather, available information suggests that they were created in a naive way, i.e without their designers having known about this relationship with the Wayland’s House type labyrinth. Nevertheless, actually, these modern neo-medieval labyrinths are the relatives of Wayland’s House. 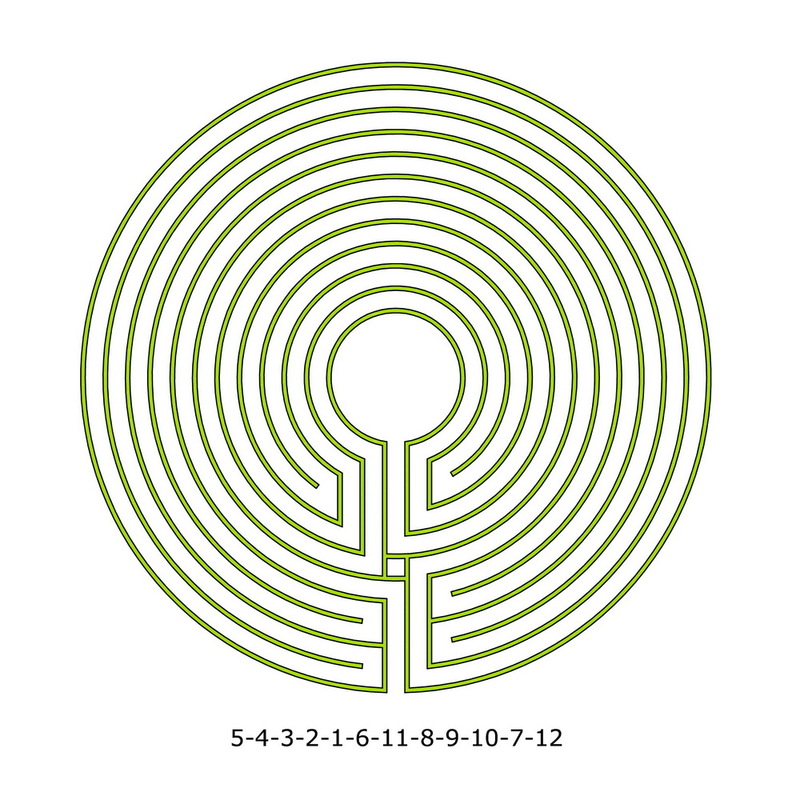 The Wayland’s House labyrinth at first glance has some similarities with the Chartres type labyrinth. However it is not self dual and its course of the pathway is guided by an other principle yet. And this applies to its relatives too. Therefore the choice of the name „Petit Chartres“ to me seems inconvenient. It seems like this name was chosen because this type of labyrinth originally was designed in the Chartres-style. So this type seems to have been named after its style. Among labyrinths with mulitple arms it is also common that one labyrinth is interesting and the complementary to it is uninteresting. 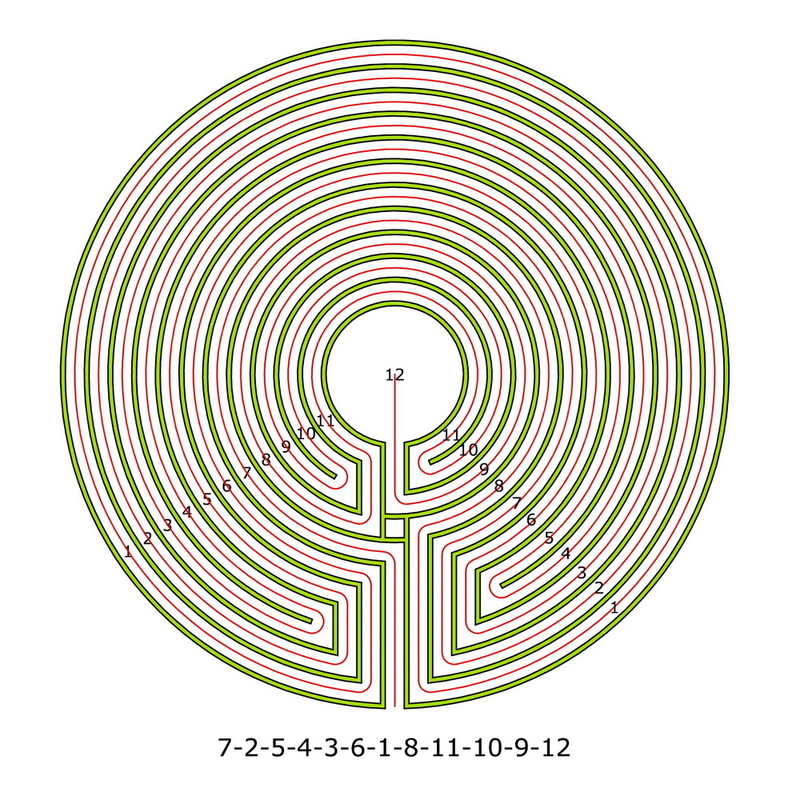 An example for this is the labyrinth of the type Ravenna (figure 1). This labyrinth has 4 arms and 7 circuits. The pathway enters it on the innermost circuit and reaches the center from the fifth circuit. It is, thus, an interesting labyrinth. 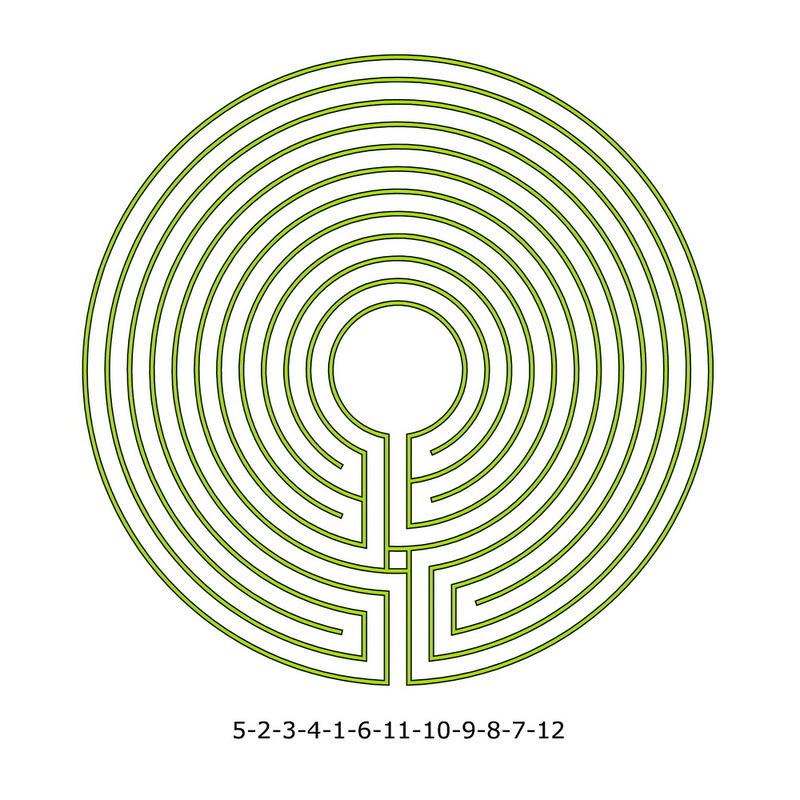 This type of labyrinth has been named after the example laid in church San Vitale from Ravenna. What is really special in this example is the graphical design of the pathway. 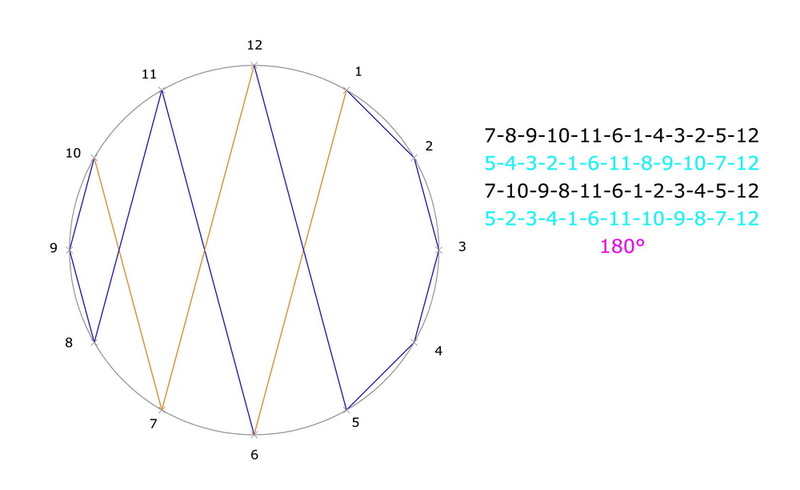 This is designed by a sequence of triangles pointing outwards. The effect is, that the direction from the inside out is strongly highlighted. This stands in contrast to the common way we use to approach a labyrinth and seems just an invitation to look up the dual of this labyrinth. 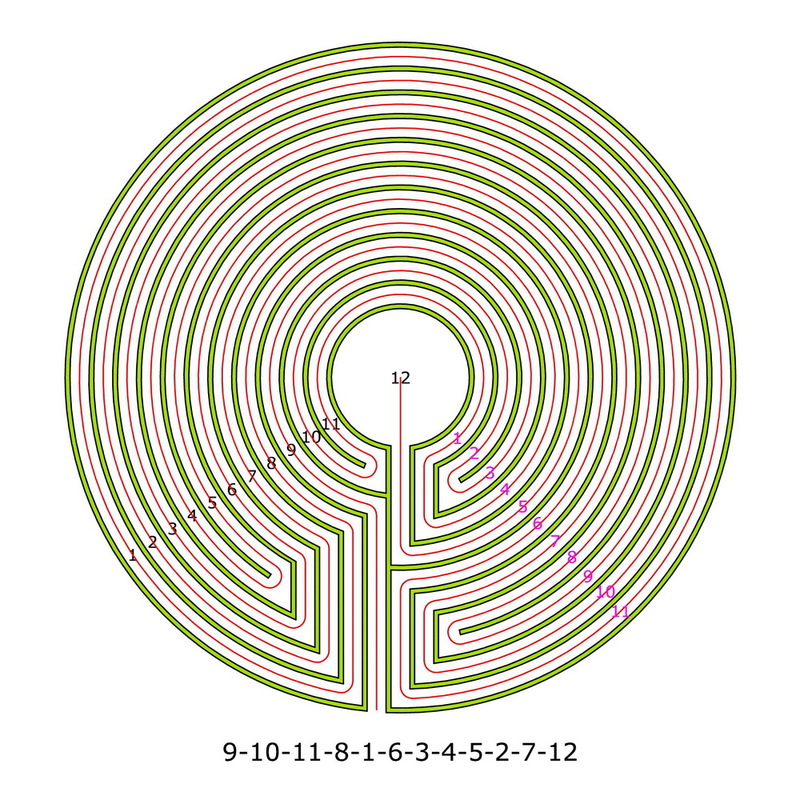 Because the course of the pathway from the inside out of an original labyrinth is the same as the course from the outside into the dual labyrinth. I term as relatives of an original labyrinth the dual, complementary, and complementary-dual labyrinths of it. In fig. 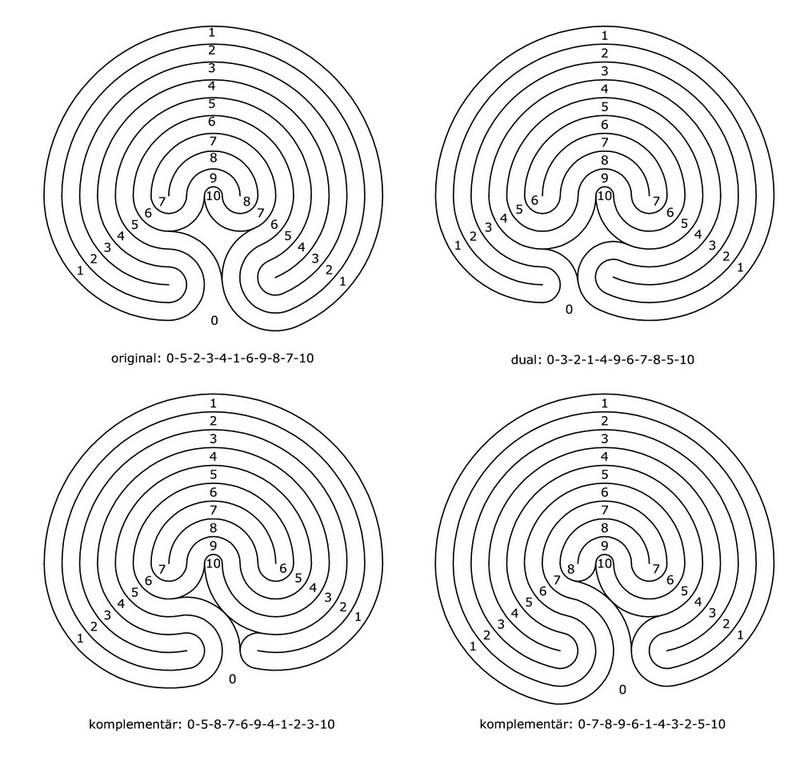 2 the patterns of the Ravenna-type labyrinth (a, original), the dual (b), the complementary (c), and the complementary-dual (d) of it are presented. 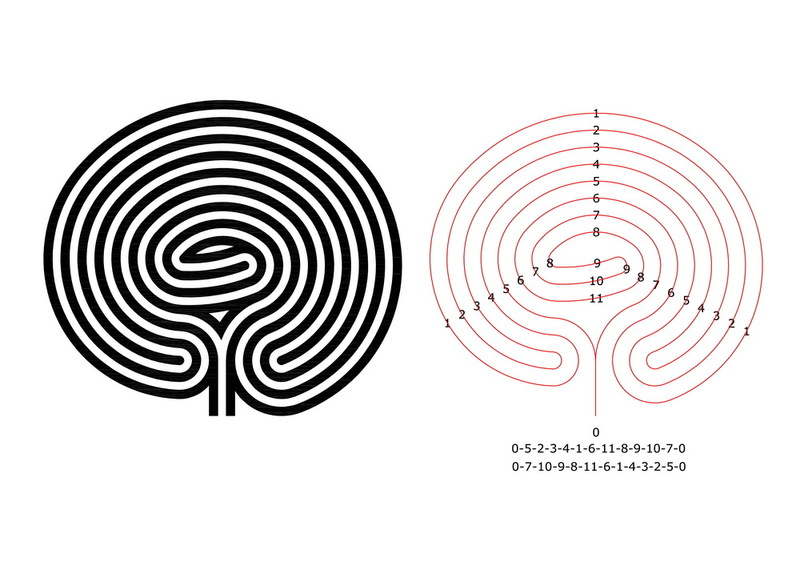 The original (a) and the dual (b) are interesting labyrinths. The complementaries of them are uninteresting labyrinths, because in these the pathway enters the labyrinth on the outermost circuit (c) or reaches the center from the innermost circuit (d). The dual of an interesting labyrinth always is an interesting labyrinth too, the dual of an unintersting is always uninteresting labyrinth too. 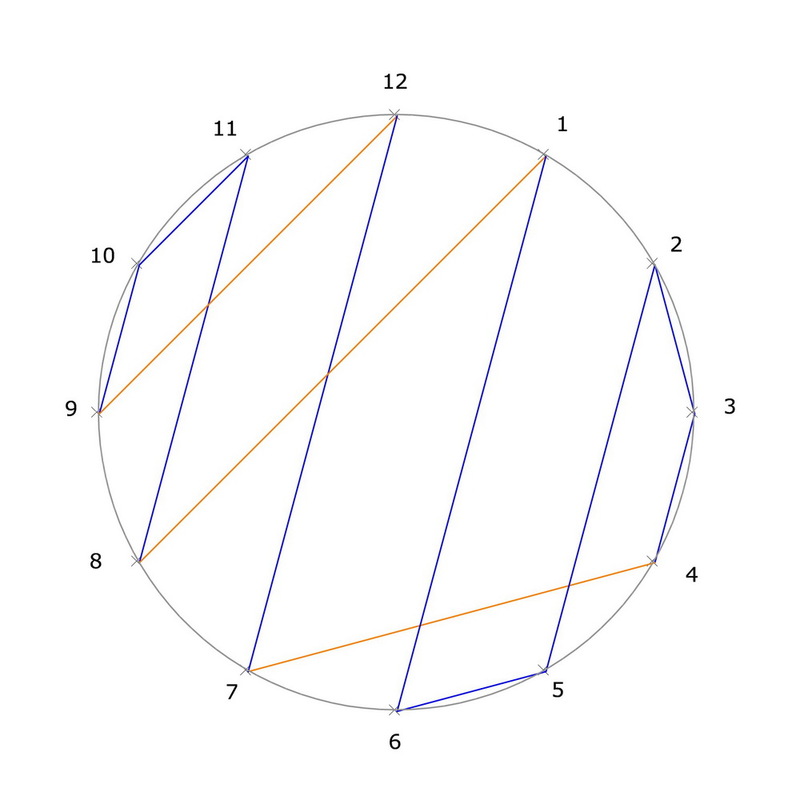 Figure 3 shows the labyrinths corresponding to the patterns in their basic form with the walls delimiting the pathway on concentric layout and in clockwise rotation. Presently, I am not aware of any existing examples of a dual (b), complementary (c) or complementary-dual (d) to the Ravenna type labyrinth (a). 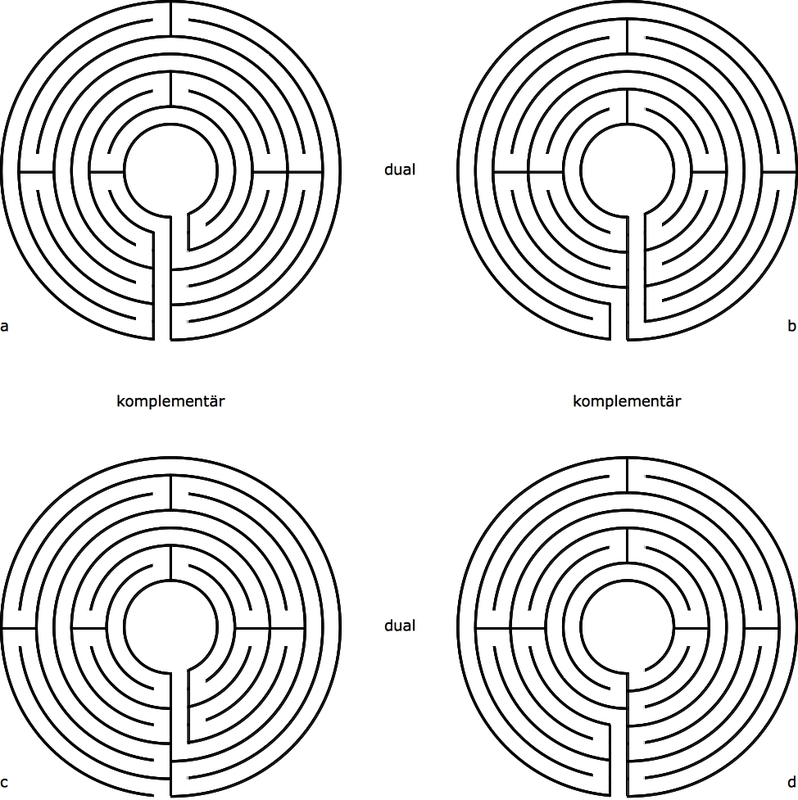 From these basic forms it can be well seen that it seems justified to classify the complementary and complementary-dual labyrinths as uninteresting. The outermost (labyrinth c) and innermost (labyrinth d) respectively walls delimiting the path appear disrupted. 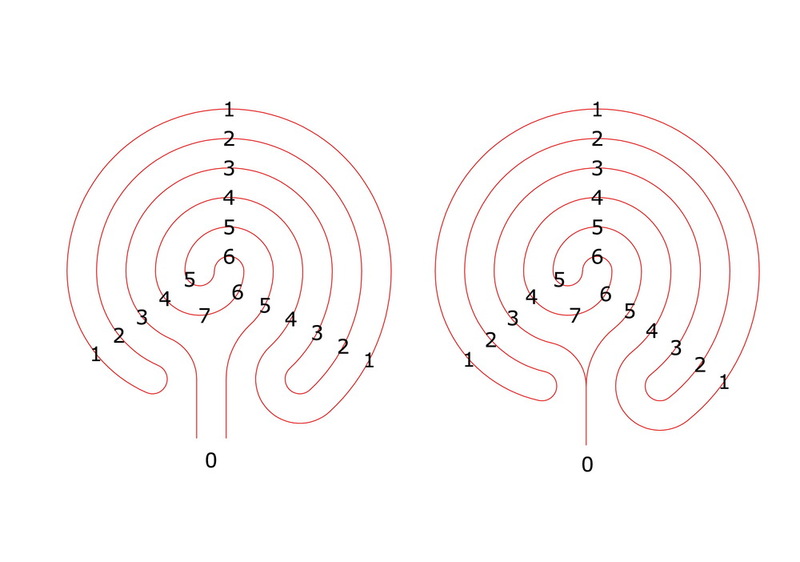 Therefore labyrinths c and d seem less perfect than the original (a) and dual (b) labyrinths, where the pathway enters the labyrinth and reaches the center axially. 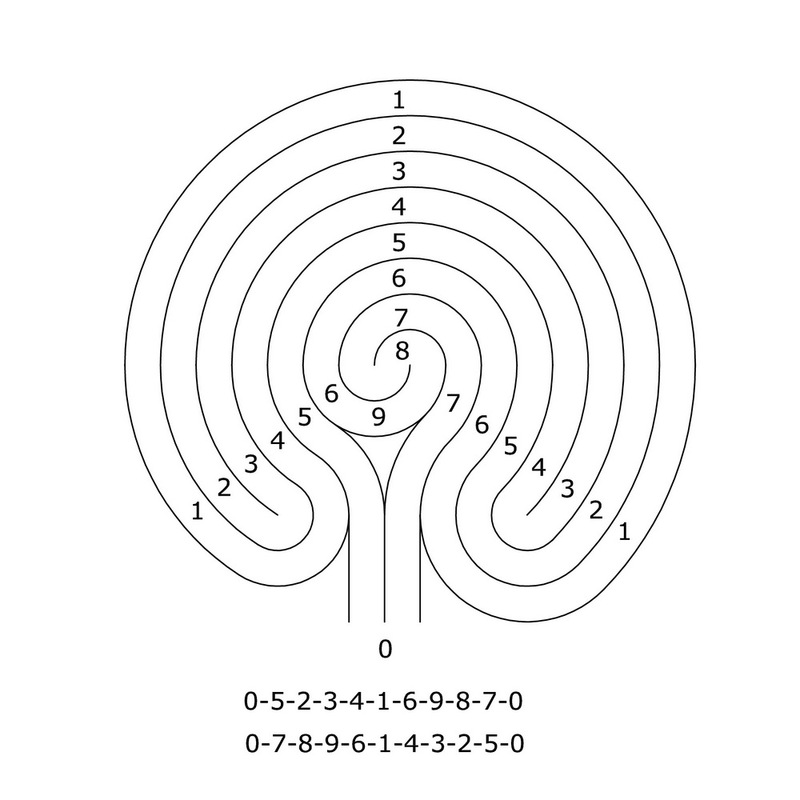 We take a 7-circuit classical labyrinth and number the single circuits from the outside inwards. 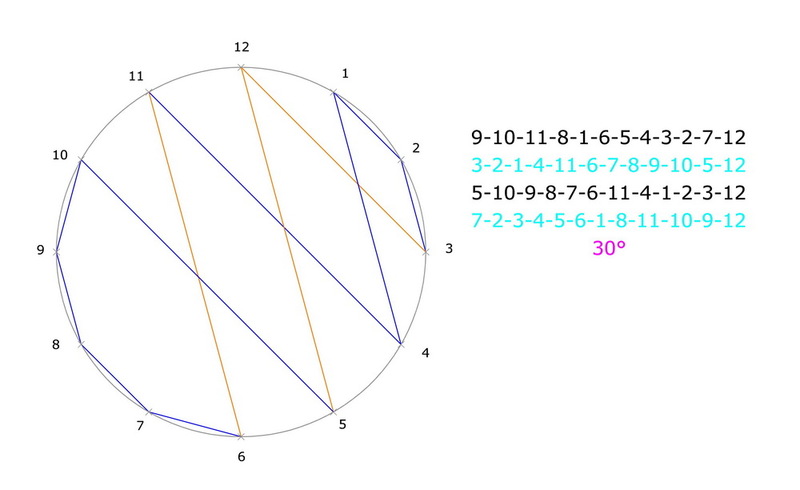 “0” stands for the outside, “8” denotes the center. I take this two numbers into the circuit sequence, although they are no circuits. 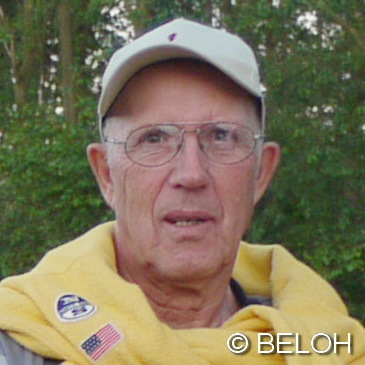 As start and end point they help to better understand the structure of the labyrinth. Everybody which already has “trampled” Ariadne’s thread (the path) in the snow knows this: Suddenly there is no more place in the middle, and one simply goes out. And already one has created a walk-through labyrinth. This is possible in nearly all labyrinths. If one wants a more compact labyrinth, one must change the shape. The internal circuits become, in the end, a double spiral. We can make either two separate ways or join them. So we will get a bifurcation. 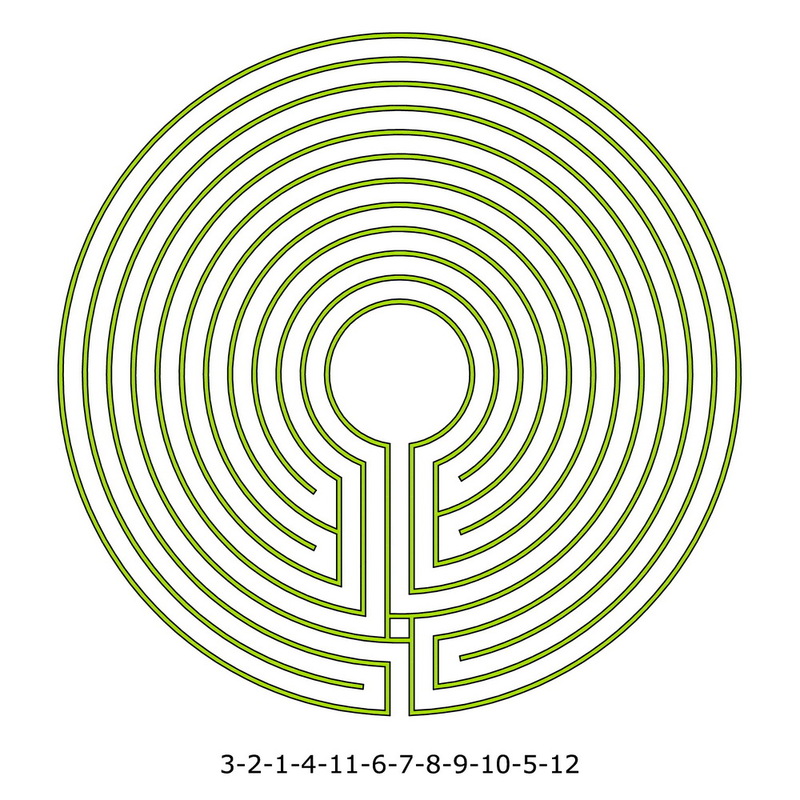 This means: If I go to the left, I am in the original labyrinth, if I go to the right, I cross the complementary one. It has the circuit sequence 0-5-6-7-4-1-2-3-8. 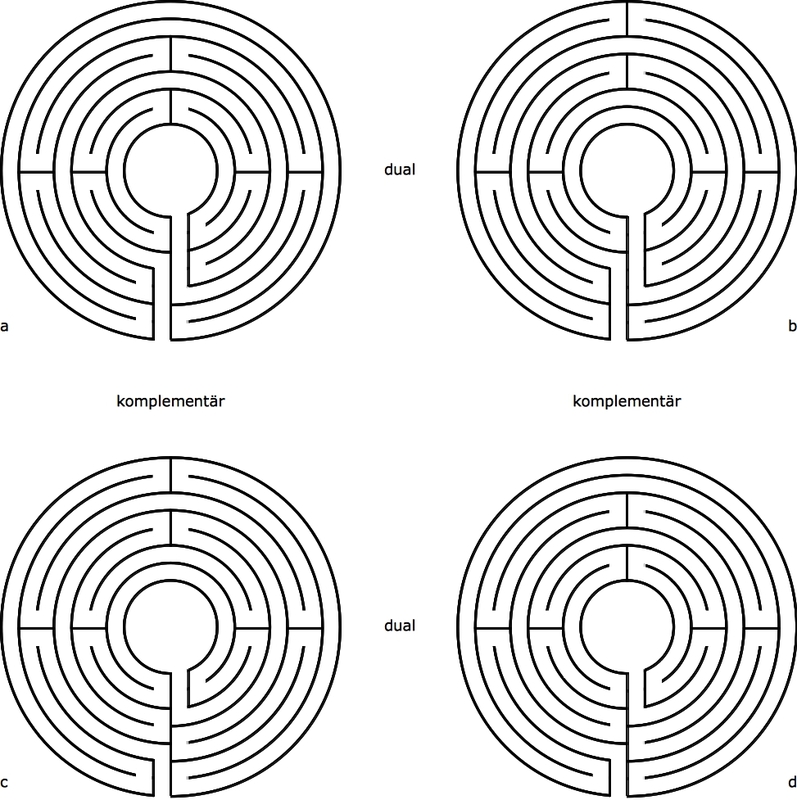 Or said in other terms: The walk-through labyrinth contains two different labyrinths, the original one and the complementary one. 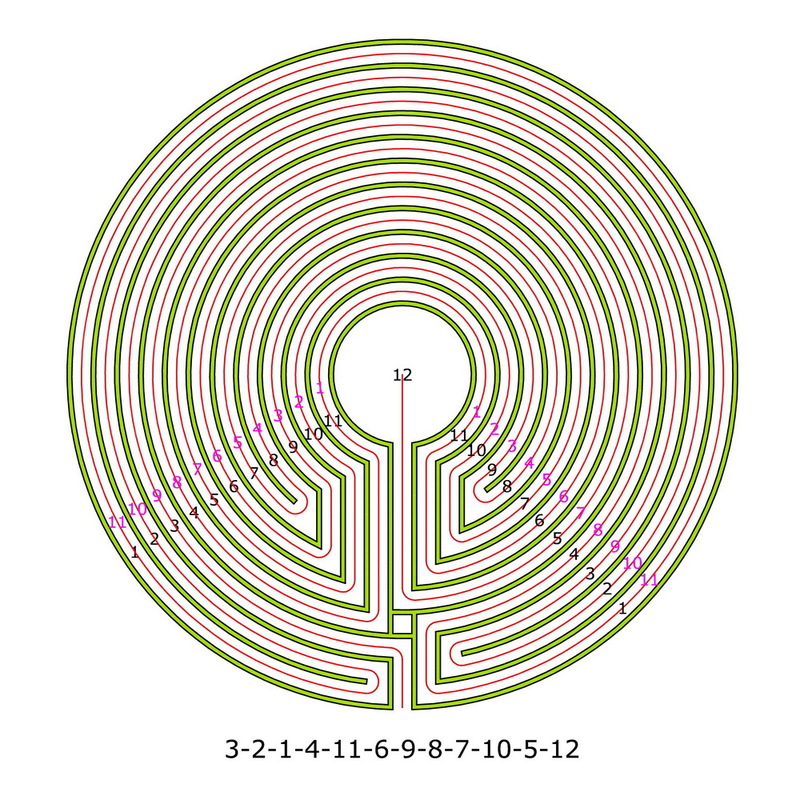 The 7-circuit labyrinth is self-dual. Therefore I only get two different labyrinths through rotation and mirroring as Andreas has described in detail in his preceding posts. 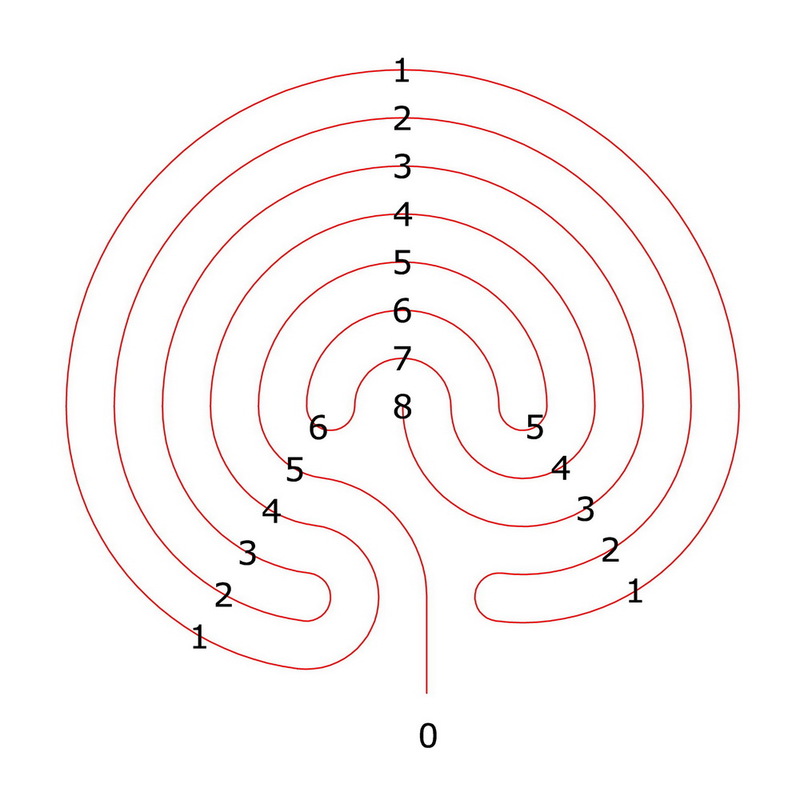 How does the walk-through labyrinth look if I choose a non self-dual labyrinth? Here the boundary lines are shown. On the top left we see the original labyrinth, on the right side is the dual to it. On the bottom left we see the complementary to the original (on top), on the right side is the dual to it. However, this dual one is also the complementary to the dual on top. The first walk-through labyrinth shows the same way as in the original labyrinth if I go to the left. If I go to the right, surprisingly the way is the same as in the complementary labyrinth of the dual one. 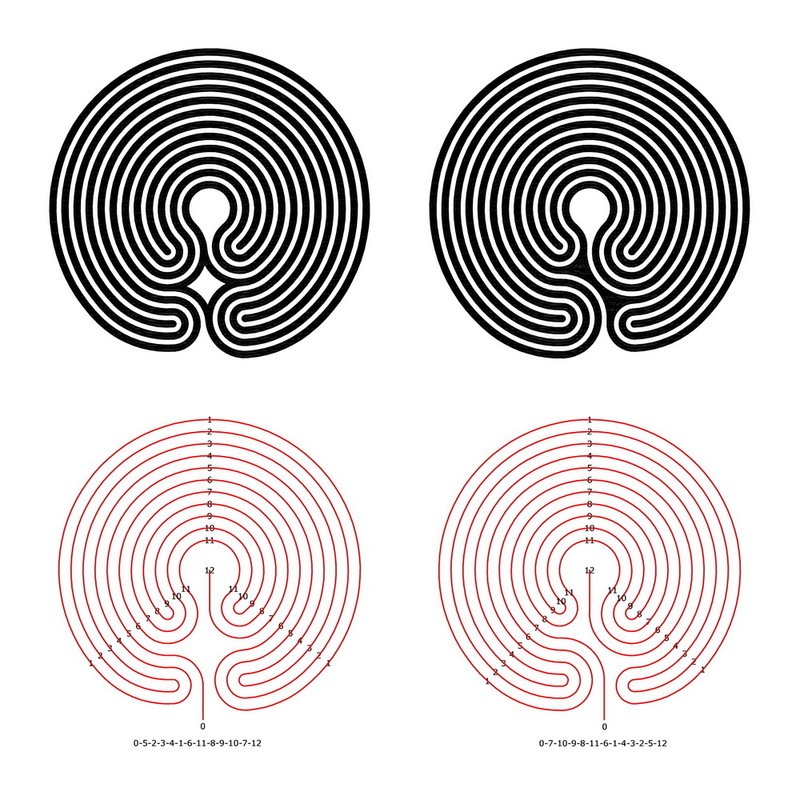 The left way corresponds to the dual labyrinth of the original. The right way, however, to the complementary labyrinth of the original. 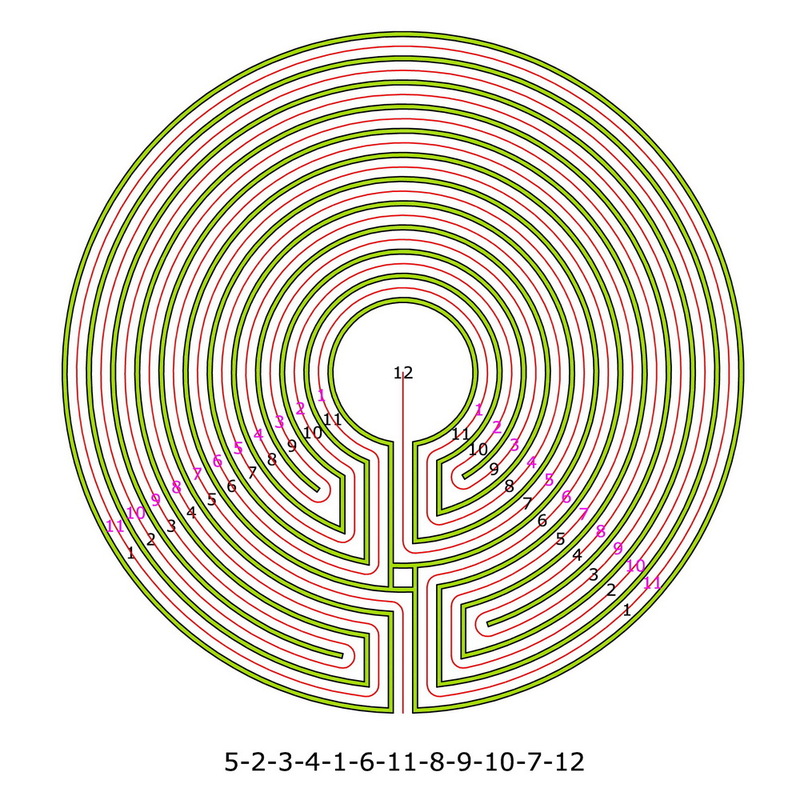 Now we look again at a self-dual labyrinth, an 11-circuit labyrinth which was developed from the enlarged seed pattern. 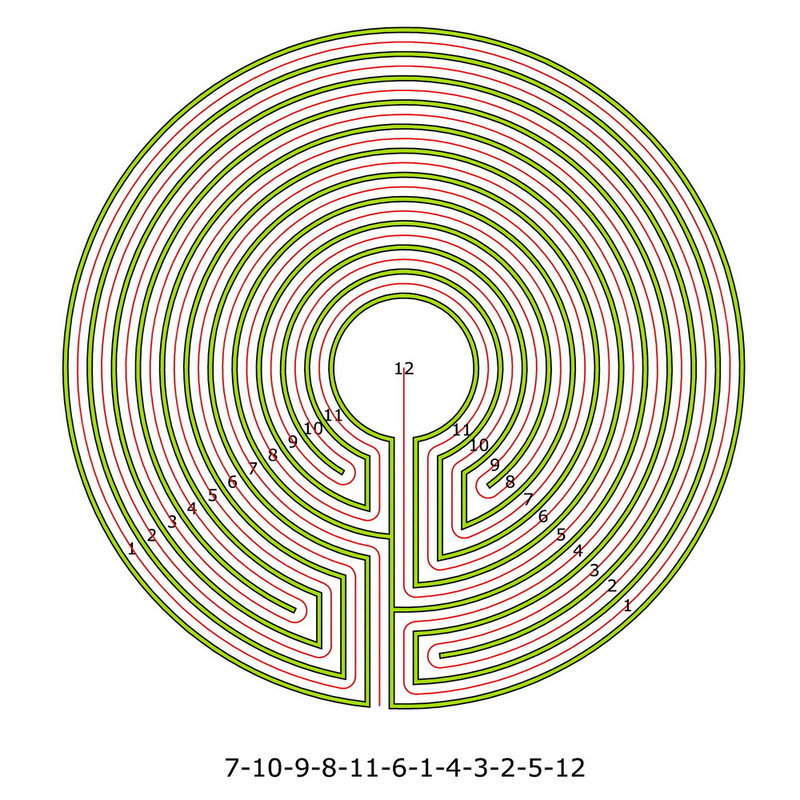 Again we see the original and the complementary labyrinth combined in one figure. 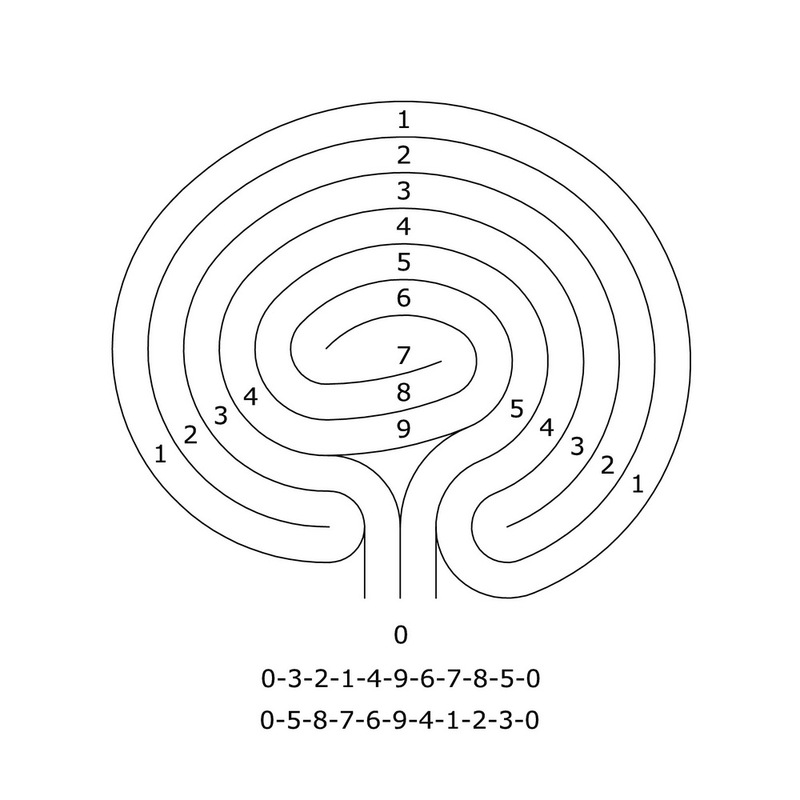 If we read the sequences of circuits forwards and backwards we also see that both labyrinths are mirror-symmetric. This also applies to the previous walk-through labyrinths. 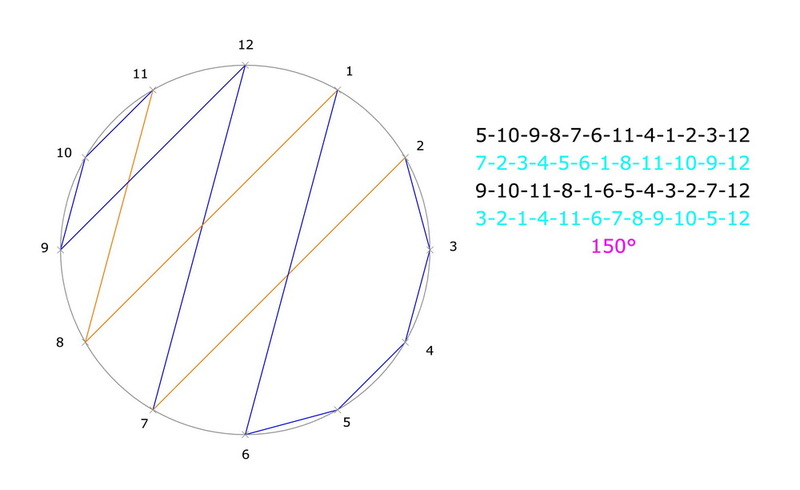 Now this are of all labyrinth-theoretical considerations. However, has there been such a labyrinth already as a historical labyrinth? By now I never met a 7- or 9-circuit labyrinth, but already an 11-circuit walk-through labyrinth when I explored the Babylons on the Solovetsky Islands (see related posts below). Besides, I have also considered how these labyrinths have probably originated. Certainly not from the precalled theoretical considerations, but rather from a “mutation” of the 11-circuit Troy Towns in the Scandinavian countrys. And connected through that with another view of the labyrinth in this culture. There is an especially beautiful specimen of a 15-circuit Troy Town under a lighthouse on the Swedish island Rödkallen in the Gulf of Bothnia. It has an open middle and the bifurcation for the choice of the way. 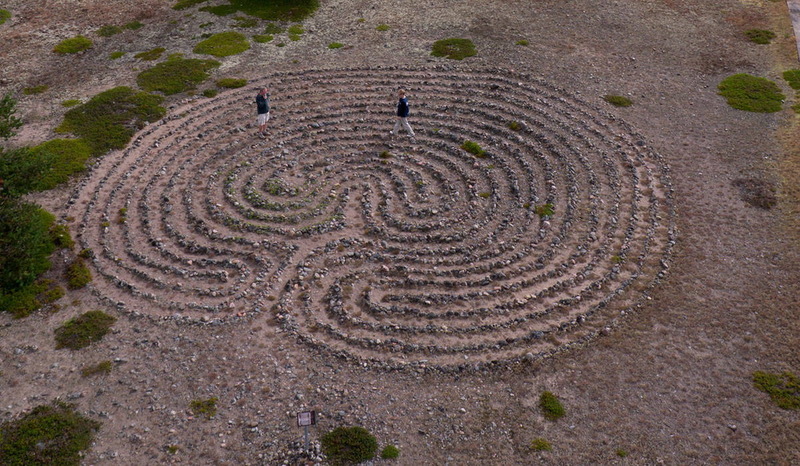 This article by Göran Wallin on the website Swedish Lapland.com reports more on Swedish labyrinths. For me quite a special quality appears in these labyrinths, even if there is joined a change of paradigm.